When The Mirror presented, as last Sunday’s issue, a series of quotes and excerpts from publicly available documents it was done with the hope that some quick negative conclusions – not based on available texts, either disregarding, or even contradicting them – can be avoided. Some steps in time are clear and not contested, especially the 1962 decision of the International Court of Justice in The Hague, stating that it …FINDS THAT THE TEMPLE OF PREAH VIHEAR IS SITUATED IN TERRITORY UNDER THE SOVEREIGNTY OF CAMBODIA. Whilst fully respecting the sovereignty of the States on whose territory the cultural and natural heritage… is situated, and without prejudice to property right provided by national legislation, the States Parties to this Convention recognize that such heritage constitutes a world heritage for whose protection it is the duty of the international community as a whole to co-operate. (Article 6.1). The inclusion of a property situated in a territory, sovereignty or jurisdiction over which is claimed by more than one State, shall in no way prejudice the rights of the parties to the dispute. (Article 11.3). The UNESCO World Heritage Convention is concerned about World Heritage Sites, “part of the world heritage of mankind as a whole,” not about the solution of border problems. Encourages Cambodia to collaborate with Thailand for safeguarding the value of the property, in view of the fact that peoples of the surrounding region have long treasured the Temple of Preah Vihear,.. The other problem is related to the demarcation of the Cambodian-Thai border, for which both countries signed a Memorandum of Understanding in 2000. The Thai Prime Minister Abhisit Vejjajiva was quoted on 8 August 2010, to have said that “Thailand has no intention of revoking the border Memorandum of Understanding (MoU) with Cambodia inked in 2000” – he said so in response to a “demonstration in the [Thai] capital yesterday demanding the Thai government to cancel the Memorandum of Understanding.” The same report says that “under the Memorandum of Understanding, Cambodia and Thailand need to consult each other if they want to carry out any activities in the disputed 4.6 sq km territory claimed by both countries near the Preah Vihear Temple.” It is not clear whether this Memorandum was published in the media in Cambodia – only the fact of its existence, not its content, has been referenced regularly in the press. On 6 May 2008 His Excellency Mr. SOK An, Deputy Prime Minister, Minister in charge of the Office of the Council of Ministers of the Kingdom of Cambodia, welcomed his Excellency Mr. Virasakdi Futrakul, Permanent Secretary of the Foreign Ministry of Foreign Affairs of the Kingdom of Thailand accompanied by a Thai delegation during their visit to Phnom Penh. The Kingdom of Cambodia strongly stresses that the inscription of the Temple of Preah Vihear is without prejudice to the demarcation work of the Cambodian-Thai Joint Commission on Demarcation for Land Boundary (JBC) between Cambodia and Thailand; and the zoning (“Zonage” in French) stipulated in the document submitted by Cambodia to UNESCO shall not be considered as boundary line. The proposals of Prime Minister Hun Sen, who has also in other situations worked successful for win-win results, solving complex problems, provide a clear way towards a solution for both problem, based on the existing common agreements. When the media in both countries – Cambodia and Thailand – quote various sources to make conflicting claims, it is again an occasion to try to mirror these sources and leave it to our readers to draw their conclusions. As ever, such a statement is always combined with the invitation to point out if the sources we quote are misquoted, or if there is an important reference missing. But it is not convincing to accuse the writer of this documentation simply to be wrong without showing substantive evidence, as happens sometimes. What follows is all based on publicly available documents. But as this case is complex, the following text is long; maybe a lot of confusion comes from not reading the texts. The pieces presented here were selected in the hope that some quick negative conclusions – not based on available texts, either disregarding, or even contradicting them – can be clarified. All this is written, to quote words from the final agreements negotiated by Senior Minister Sok An with representatives of Thailand and UNESCO before the decisive meeting of the World Heritage Committee in July 2008 – in a spirit of friendship and cooperation, in the spirit of goodwill and conciliation – as it is stated in the final joint document before the 2008 decisions. Going back in history is often necessary to clarify facts. But their meaning may have changed over time. As a German, I know that there was a time when the Germans considered that Karl der Grosse, crowned in the year 800 – not long before the temple of Preah Vihear was started to be built – is at the beginning of our German history, while also the French considered Charlemagne as their’s. Actually, at his time, he ruled over large parts of western and central Europe, not over France or Germany as they exist now. But since the French Minister of Foreign Affairs Robert Schuman – a French with a good German name – took the initiative in 1950 to create again common political entities in Europe – the European Union – we have almost forgotten the old historical and emotional divides. There is a long pre-history for the present history of the Preah Vihear conflicts. But for the discussion of the present situation, it may be enough to start in 1962, when the International Court of Justice in The Hague came to the conclusion that it …FINDS THAT THE TEMPLE OF PREAH VIHEAR IS SITUATED IN TERRITORY UNDER THE SOVEREIGNTY OF CAMBODIA. Cambodian comments often go further back. Maybe this is not necessary, as the 1962 court ruling is not questioned by the political leadership of the governments of both sides, in spite of the fact that this is often disregarded or denied. It is not surprising that some people, even some people with a wide group of supporters, have taken different positions. The present government of Thailand accepts the 1962 verdict. Whoever doubts this, should provide quotable evidence. Last week, after a group of Thai nationalists had demonstrated in front of the UNESCO office in Bangkok on 27.7.2010, rejecting any discussion of the status of Preah Vihear by the World Heritage Committee, the Thai prime minister invited representatives of the People’s Alliance for Democracy – PAD, widely overlapping in membership with the “Yellow-Shirts” – to clarify where he does not agree, and where he agrees with them. “The PAD wanted an end to the Thai-Cambodia Memorandum of Understanding, because it ‘turned a Thai territory into a disputed territory.’ But Abhisit thought that the MOU turned a territory that Cambodia thought to belong to them, to become a disputed territory. The PAD wanted the government to boycott the World Heritage Committee meeting in Brazil, because attending the meeting would signify that Thailand accepted the listing of Preah Vihear as a world heritage site, and only disagreed with the temple’s management plan. But for the Thai prime minister, it is exactly the present management plan which he did not want to see accepted. To disregard this point is obviously confusing, not clarifying, the state of affairs. Or is it this way of interpreting the MOU – the Joint Communique – assumed to by the Thai prime minister’s one, also a reason why the media in Cambodia never published the Joint Communique (details further down), neither in Khmer nor in English? It is difficult to understand why such an important document, including a new Cambodian draws map, which was discussed in parliament in Thailand, was not – at that time or later – presented also to the Cambodian public. The inscription into the World Heritage List was first proposed by Prime Minister Hun Sen to the UNESCO Director General on 10 October 2001. The necessary detailed documentation was submitted on 20 January 2006. The Cambodian Nomination File was considered by the next session of the World Heritage committee, meeting from 23 June to 2 July 2007 in Christchurch/New Zealand. d) Protection of the natural forest areas surrounding the property, especially of small areas where burning has been recently observed on the Cambodian territory. The State Party of Cambodia and the State Party of Thailand are in full agreement that the Sacred Site of the Temple of Preah Vihear has Outstanding Universal Value and must be inscribed on the World Heritage List as soon as possible. The World Heritage Committee, further requests the State Party of Cambodia to submit a progress report to the World Heritage Center, by 1 February 2008. In a spirit of friendship, neighborliness and mutual understanding between the two countries, the Royal Government of Cambodia and the Government of the Kingdom of Thailand have been working together in recent months to strengthen dialogue and consultation in a number of areas of mutual interests. These fruitful developments focus in particular on inscribing the TEMPLE OF PREAH VIHEAR on the World Heritage List in 2008. Thailand has confirmed its decision, as expressed at the 31st Session of the World Heritage Committee held in Christchurch (New Zealand, 23 June to 2 July 2007), to support the inscription of the Sacred Site of the Temple of Preah Vihear. This wording became part of the JOINT COMMUNIQUE of 18 June 2008, a joint Cambodian-Thai-UNESCO declaration, the last common step towards the World Heritage Committee meeting on 8 July 2008. The Kingdom of Thailand supports the inscription, at the 32th session of the World Heritage Committee (Quebec, Canada, July 2008), of the Temple of Preah Vihear on the World Heritage List proposed by the Kingdom of Cambodia, the perimeter of which is identified as N. 1 in the map prepared by the Cambodian authorities and herewith attached. 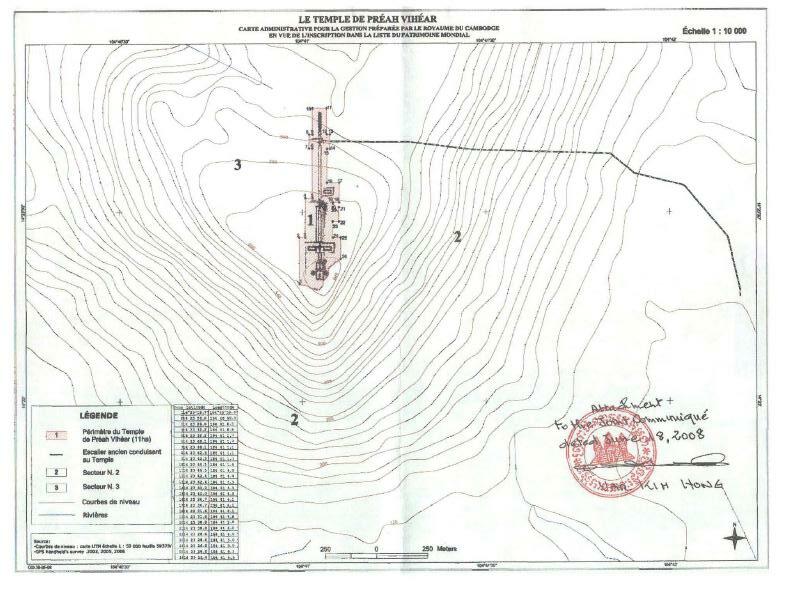 The map also includes, identified as N.2, a buffer zone to the East and South of the Temple. The inscription of the Temple of Preah Vihear on the World Heritage List shall be without prejudice to the rights of the Kingdom of Cambodia and the Kingdom of Thailand on the demarcation works of the Joint Commission for Land Boundary (JBC) of the two countries; 6. The Kingdom of Cambodia and the Kingdom of Thailand express their profound appreciation to the Director-General of UNESCO, H.E. Mr. Koïchiro Matsuura, for his kind assistance in facilitating the process towards the inscription of the Temple of Preah Vihear on the World Heritage List. There had been some final problems: The Cambodian side, represented by Deputy Prime Minister Sok An and Senior Minister in Charge of Border Affairs Var Kimhong – “in the spirit of goodwill and conciliation” – negotiated and made incisive decisions (having the former Cambodian map as well as graphic references, referring to the 1962 decisions “superseded” by the new Cambodian side map presented here, declaring that Cambodia “accepts that the Temple of Preah Vihear be nominated for inscription on the World Heritage List without at this stage a buffer zone on the northern and western areas of the Temple” – all this without much discussion in the Cambodian public. On the other side, however, the Thai Minister of Foreign Affairs was instructed by the Constitutional Court of Thailand that the government would need, for such decision, the authorization by the Thai parliament. In spite of these last minute reservations, the World Heritage Committee declared the Temple of Preah Vihear a World Heritage site. Instead of peaceful continued cooperation, confrontation and violence followed. d) progress report on the preparation of the Management Plan. In spite of these clear requests by the World Heritage Committee for cooperation, the Thai government declared, even some days before the recent meeting in Brazil, that they had not received any invitation to cooperate, nor information about the Cambodian submission. As a result, representatives of the Thai government, up to Prime Minister Abhisit Vejjajiva, stated that Thailand could not accept a decision about a management plan, though Thailand would have had to be involved in its consideration, if previous recommendations of the World Heritage Committee would have been implemented. Will it end one day, and soon enough, after 150 years of its happening? Cambodia had nothing to do with it. Thailand plans to oppose a management plan for the Preah Vihear temple while overlapping territory nearby remains subject to dispute, Foreign Minister Kasit Piromya says. Cambodia does not have “an overlapping territory” with Thailand. There was a claim by Thailand that uses the unilateral map in similar fashion as the Nazis (led by Hitler) and the Fascists (led by Mussolini) for the purpose sending troops to invade and occupy foreign territory. One cannot be sure if this is an attack against Deputy Prime Minister Sok An, or whether Mr. Pen Ngoeun, though he is an Advisor to the Office of the Council of Ministers, a member of the Advisory Board of the Press and Quick Reaction Unit (PRU) of the Office of the Council of Ministers, does not know that the documents, elaborated with great care by the Deputy Prime Minister, spell out in detail the buffer zones, otherwise referred to as overlapping territories, and it was the Cambodian side, that presented a map to “supersede” the formerly used maps, relating to the 1962 decision of the International Court of Justice. To make sure that Kasit does not bang his head too much against the wall from trying to come up with new innuendo, suggestion and speculation, here is a crude fact to chew: The Temple of Preah Vihear has been inscribed on the World Heritage List since 2008. Kasit need to pick up the WHC 32 COM 8B. 102 and read it… It is clear from a few sentences above, that Cambodia has implemented the requirements of the World Heritage Committee – WHC – and has conformed herself to the procedures set forth by the Committee. And NOT to leave the door wide open for speculation and mind twisting, Deputy permanent secretary for culture Somsuda Leyananija has the task to tell the truth, as to why… Let’s play the game, fair and square in conformity with the WHC rules and procedures. Decides to consider the documents submitted by the State Party at its 35th session in 2011. On the contrary, the Thai intoxication campaigns’ spending of B10 millions with the dispatch of 50 delegates in order to oppose the management plan at the site of the Cambodian Temple of Preah Vihear, was a total debacle because Thailand had no substantive arguments against the World Heritage Centre Report of the two documents submitted by Cambodia. Moreover, Thailand has failed in its efforts to have the Temple inscribed by the two countries, and has failed in its efforts to have joint management of the Temple. The Press and Quick Reaction unit of the Office of Council of Ministers notes that the signing of the Compromise Decision 34 COM, 7B.66 by Cambodia, Thailand, and witnessed by the Chairperson for the 34th Session of the World Heritage Committee in Brazil clearly affirmed the recognition by all parties concerned of the official documents concerning the Management Plan for the conservation and sustainable development at the site of the Cambodian Temple of Preah Vihear, which had never been recognized previously. To underline further the failure of the Thai Government, it must be stressed for the benefits of the public and international opinion that it is not like what the Thai Government claimed that it had succeeded to “postpone”the Management Plan to next year. In fact, the WHC final decision did not mention either about the terms Postpone – Defer or Delay but choose to use the wording Consider which means that the documents submitted by Cambodia, namely the Progress Report on the State of Conservation and Development of Preah Vihear and its Management Plan, were officially received by WHC and will consider it at the next session. Part of the reality is also geography. This picture provides a view over the Temple of Preah Vihear: 500 meters down, to the left, is the landscape of the Cambodian Province of Preah Vihear; the temple lies at a different level, high above the plain. Until mid 2008, it was easily accessible for thousands of tourists, approaching the Temple of Preah Vihear from the Thai side, on the right of the picture, from the Khao Pra Viharn National Park. also to your colleagues and friends. “The Ministry of Foreign Affairs of Cambodia accused the director of the Office of the High Commissioner for Human Rights in Cambodia, Mr. Christophe Peschoux, claiming that he acted beyond his role when he criticized the deportation of two Thai red-shirt activists on Monday 5 July 2010, and the Ministry warned that such comment from him might make the government reconsider his presence in Cambodia. “On Wednesday, 7 July 2010, the director of the Office of the High Commissioner for Human Rights in Cambodia, Mr. Christophe Peschoux, spoke to local media, saying that the deportation of the two Thais are ‘political decisions’ which lack appropriate procedure. “This letter is similar to one sent in March to the United Nations Resident Coordinator, Mr. Douglas Broderick, which had warned to expell him from Cambodia for criticizing the process taken by the government for the adoption of the anti-corruption law. “Phnom Penh: A parliamentarian and high ranking official of the Cambodian People’s Party voiced his strong reaction by totally rejecting a report of the Committee for Free and Fair Elections (COMFREL) on Thursday 11 February 2010, and of an announcement by the Inter-Parliamentary Union (IPU) over the suspension of the immunity of Sam Rainsy Party parliamentarians. “The parliamentarian from Prey Veng and chairperson of the Commission on Economy, Banking, and Audits of the National Assembly, Mr. Cheam Yeap, said that the Cambodian People’s Party won the through the  elections as many as 90 seats, more than two thirds of the total of 123 seats. Under this situation, leaders of the Cambodian People’s Party do not commit any wrongdoings, because it could affect the confidence of citizens who are voters or party members. “Mr. Cheam Yeap stressed that both the government and the National Assembly are not worried, because what they have done complied with the Cambodian law. “The reaction of the parliamentarian from the ruling Cambodian People’s Party was made a day after COMFREL had issued a report on 10 February 2010 which says that democracy in Cambodia is being affected, because the Cambodian People’s Party caused the freedom of expression and the discussions in the National Assembly to diminish. Also, criticism of the suspension of the immunity of the Sam Rainsy Party parliamentarians in three cases – of Mr. Sam Rainsy, of Ms. Mu Sochua, and of Mr. Ho Van – was easily made but was not based on the law. “Meanwhile, the IPU criticized, on 10 February 2010, that the suspension of the immunity of the three Sam Rainsy Party parliamentarians did not go through careful discussions and reviews beforehand. The IPU added that it will put this issue on the agenda of the 122nd meeting in April and May 2010. “Regarding the suspension of the immunity, [the Sam Rainsy Party parliamentarian] Mr Ho Van appealed to the president of the National Assembly to give him back his immunity, because the judgment of the Phnom Penh Municipal Court dated 2 February 2010 decided to lift the accusation against him, over his assumed defamation against 22 senior military officials, and it has been sent to the president of the National Assembly. The claim that the Cambodian government has fully met the requirements of the UNESCO World Heritage Committee is surprising for the interested public, as it has only been reported that a Cambodian report was submitted before 1 February 2010 to the World Heritage Committee, while there is no report how the following requirements, from the UNESCO minutes, have been fulfilled – and the Thai government publicly claims that they do not know the Cambodian report – though the Thai government should have been involved – according to the UNESCO minutes. These points touch on matters where “the participation of the Government of Thailand” seems to be required, according to the UNESCO minutes, as the border demarcation between Cambodia and Thailand has not yet been accomplished. Further details are in the lower section of The Mirror of 7 February 2010. “Cambodia has requested the United States of America to support the candidacy of Cambodia to become a non-permanent member of the United Nations Security Council. “During a meeting between the Minister of Foreign Affairs and International Cooperation, Mr. Hor Namhong, and [the US Deputy Assistant Secretary of State and US Ambassador to ASEAN] Mr. Scot Marciel at the Ministry of Foreign Affairs in the morning of 9 February 2010, Mr. Hor Namhong requested the USA, through Mr. Scot Marciel, to support Cambodia’s candidacy as a non-permanent member of the UN Security Council for 2013 and 2014. “Since Cambodia has become a member of the United Nations, it has never participated working in the framework of the UN Security Council. “Mr. Hor Namhong pointed out to Cambodia’s qualifications to serve as a non-permanent member of the UN Security Council, saying that Cambodia, with the help from the UN Transitional Authority in Cambodia (UNTAC), in 1993 organized free and fair elections for the first time in Cambodia after it had been freed from the Pol Pot genocidal regime. “The next non-permanent Security Council Members of the United Nations will be elected in 2012. “It should be noted that in recent years, Cambodia has sent its troops within the UN framework to help many developing countries and countries that have just recovered from war, such as Chad. “During the meeting, Cambodia also requested America to cancel the debt that Cambodia owes America since the time of the Lon Nol regime time [the Khmer Republic, 1970 to 1975]. “Cambodia owes America more than US$300 million since the Lon Nol regime from 1970 to 1975. The Cambodian Daily further reports: “Mr. Maciel also said that the had reiterated in the meetings that the US was ‘very disappointed’ with Cambodia’s decision in December 2010 to deport 20 ethnic Uighur asylum seekers back to China over the objections of the UN High Commissioner for Refugees” [contrary to the Cambodian commitment to the relevant UN conventions]. “Cambodia suggested two ways the USA could cancel the debt. In the first choice, Mr. Hor Namhong suggested the USA could just cancel all the debt, but as an alternative choice, he asked the USA via Mr. Scot Marciel to cancel 70% of the debt of more than US$300 million in order to allow Cambodia to develop the country. Cambodia would pay back the rest of 30% to the USA later. “Though he listened that there are these two modalities proposed by Cambodia, Mr. Scot Marciel could only say that he will bring Cambodia’s request about the canceling of debt to the US government when he returns back. “The Royal Government of Cambodia issued a royal sub-decree about the conditions and modalities for a census for the recruitment, the conscription, and for the possible delays for youth who are studying, and for citizens under special conditions, and about the law for the implementation of military service. “The sub-decree, signed by the head of the Royal Government, Samdech Akkak Moha Senapadei Dekchor Hun Sen, states that it aims to define the conditions and modalities for a census for the recruitment, the conscription, and the possible delays for youth who are studying, and for citizens under special conditions, and about the law for the implementation of military service. It aims to protect the territorial integrity and the national sovereignty, and contributes to the reform of the military sector, strengthening the foundation of the forces for national defense, developing citizens physically, as required by the country, and training in national defense skills. “The sub-decree describes a National Commission for Military Service, which has the Minister of Defense as its head, the Minister of Interior or a secretary of state as the deputy head, the commander-in-chief of the Royal Cambodian Armed Forces [RCAF] as another deputy head, the Minister of Economy and Finance or a secretary of state, the Minister of Planning or a secretary of state, the Minister of Health or a secretary of state, the Minister of Labor or a secretary of state, the Minister of Social Affairs or a secretary of state, and the secretary of the Public Affairs Secretariat, the director general of the National Police, the commander of the National Military Police as members, and director of personnel of the Ministry of Defense as a secretary. “The sub-decree adds that census for obligatory military service will be conducted by the military service committees of the communes from January to March every year. Recruitments will be made in early August every year, and the military service commissions of the commune have to issue the invitations to the citizens whose names are listed in the census lists and who live under their control, to attend to the recruitment process and the medical checkup, to prepare them for military service. “This sub-decree states also the conditions for a delay for youth who are studying, stating that the youth who can receive a delay are: students during studies to finish their courses; students preparing to take exams for higher education, for higher degrees, or for associated degrees, and for high school and lower secondary school certificates; and students receiving scholarships to study abroad and students preparing to further their education abroad. “The sub-decree offers also delay in military service for citizens under special situations. These are citizen who are the only labor force in their family and are the breadwinner of the family; citizens who have not yet reached the age to do full labor, or who are too old, or disabled; citizens who are the only child whose father or mother lost their life in the battlefield; citizen who live in a one-child-family – a family with only one child and the mother, or a child-and-father family; citizens who lost their husband or wife and have many children to raise; citizens who are receiving treatment for illness; citizens who have to leave the country with their parents to fulfill a long-term mission abroad; civil servants who have to fulfill a task abroad more than 3 months; lecturers and teachers who are working under the Ministry of Education; workers who are experts in their factories or enterprises, where a skilled replacement cannot be found immediately; and employers who are responsible leading in expert positions in their enterprises and cannot find a replacement. “As for the calls to military service, the sub-decree states that citizens who volunteer to fulfill their military service are the first ones to be conscripted. A lottery system will be used if there are more, or less, persons than needed who want to start their military service. The commissions have to conscript citizens for military serve based on the required numbers. The commune military service commissions have to send the draft notices to the conscripted persons directly through the commune authorities or its unit heads, to ministries, departments, factories, enterprises, or educational institutions, within at least 30 days before the day the conscripts are required to appear.